Kalpana Chawla, an American astronaut and the first woman of Indian origin in space, died on February 1, 2003. Fifteen years after her death, she continues to inspire all, especially young women who aspire to be astronauts. Kalpana Chawla first flew on Space Shuttle Columbia in 1997 as a mission specialist. 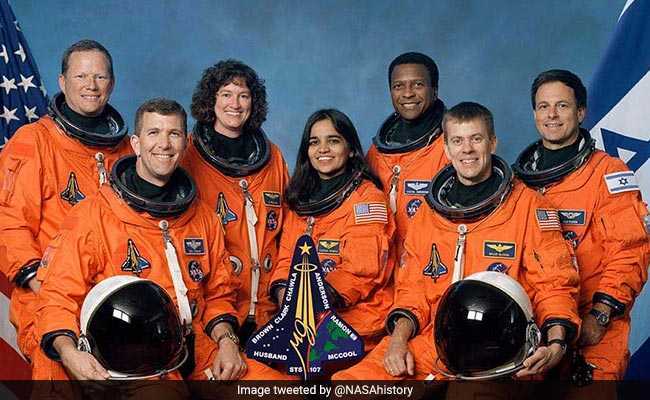 New Delhi: Kalpana Chawla, an American astronaut and the first woman of Indian origin in space, was one of the seven crew members who died in the Space Shuttle Columbia disaster when the craft disintegrated during its re-entry into the Earth's atmosphere on February 1, 2003. Kalpana Chawla was the first Indian-born woman and the second Indian person to fly in space after astronaut Rakesh Sharma. Fifteen years after her death, she continues to inspire all, especially young women who aspire to be astronauts. Kalpana Chawla was posthumously awarded the Congressional Space Medal of Honor. Kalpana Chawla was born on March 17, 1962 in Punjab's Karnal, now Haryana. As a child, Kalpana Chawla used to love drawing airplanes. She received a degree in Bachelors of Aeronautical Engineering from Punjab Engineering College in Chandigarh. She then moved to the United States in 1982 to obtain double masters and PhD in aerospace engineering. Kalpana Chawla first flew on Space Shuttle Columbia in 1997 as a mission specialist and primary robotic arm operator. After the completion of Space Shuttle Columbia post-flight activities, Kalpana Chawla was assigned to technical positions in the astronaut office to work on the space station. Kalpana Chawla was chosen for second space mission along with other six crew numbers and on January 16, 2003, she returned to space aboard Space Shuttle Columbia. The space mission, however, met the ill-fated disaster and Kalpana Chawla and other crew members died in the disaster on February 1, 15 years ago. Kalpana Chawla's remains were cremated and scattered at National Park in Utah in accordance with her wishes. In her honour, the first satellite of Met-Sat series, "MetSat-1", launched by India on September 12, 2002 was renamed "Kalpana-1. Several scholarships, streets, universities and institutions in India and the United States have been named in her honour.